Discover the wonder hidden beneath a secret garden in Hello Venice, a magical matching mission for all ages. Help Ciro and his mother Adda bring the magical garden back to its former beauty in this wonderful endeavor. Play over 70 colorful Match 3 levels as you lead water through the garden and restore life. Gain helpful power-ups, earn money to decorate the garden, and even play a fun Time Management planting game for extra cash. 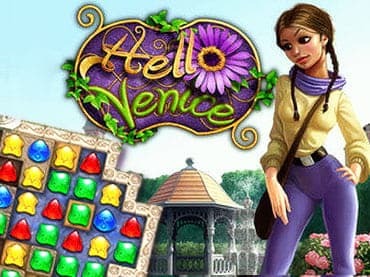 Find the magic of the secret garden when you download free full version of Hello Venice. Free Game features: - Find the magical treasures of an alchemist in this wonderful Match 3 challenge; - Play over 70 colorful levels as you lead water through the secret garden; - Gain power-ups and earn money to restore and decorate the garden to your liking; - Enjoy a fun Time Management mini-game to earn even more; - Select from different difficulties and unlock an extra play mode. If you have questions about Hello Venice game, please contact us using this form.